The nRF91 Series are Nordic’s first family of low power cellular devices for the Internet of Things. 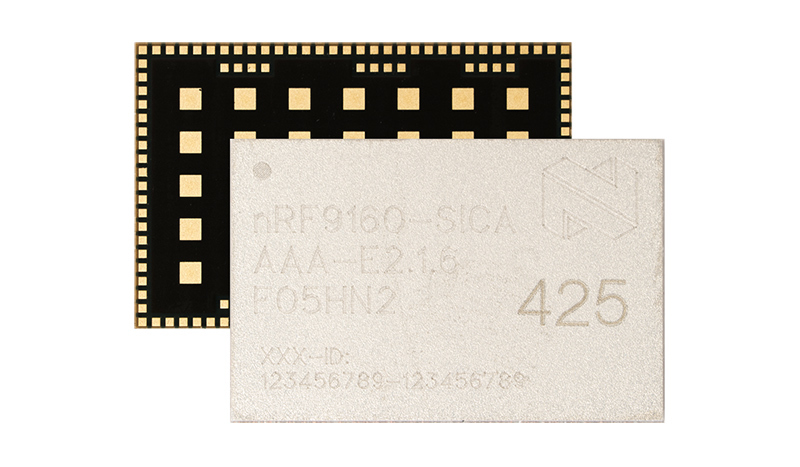 With LTE-M, NB-IoT, GPS, all RF Front End (RFFE) and power management packed into a tiny package, single chip solutions are now a real possibility for cellular IoT development. That’s important, because size matters! Smaller devices with low power requirements open up all kinds of use cases for consideration. Nordic Semiconductor’s SoC concept changed the playing field for low energy development with Bluetooth by removing complexity for developers. Now by combining the microcontroller with the modem for cellular IoT, the nRF91 Series system-in-package (SiP) is ready to do the same again. Why cellular and why now? Low power wide area networks (LPWANs) are critical to the success of IoT because they form a vital bridge between the wireless sensors used across manufacturing, agriculture, and healthcare (and just about everything else) and the Cloud. Simply put, they take low power technologies that we are used to seeing and add range to the equation. Figures from the 2018 Ericsson Mobility Report suggest that in as little as five years cellular IoT will power up to 85 percent of IoT connections worldwide. The nRF9160 is a compact SiP device that supports LTE-M and NB-IoT together with a powerful Arm Cortex-M33 dedicated application processor and on-chip GPS. It has 1MB of flash memory and 256kB of RAM with a broad array of peripherals. Beyond its LTE connectivity and positioning options, it can support a broad selection of use-case demands and brings edge computing to cellular IoT. Security takes a forward leap with the world’s first inclusion of Arm’s TrustZone and CryptoCell technologies for Cortex-M based microcontrollers and SoCs. This brings a degree of security to IoT products that was previously only available for devices suited to smartphones and computers. Our dedicated team of test and certification engineers are out travelling the world to secure certifications for operations in new regions and with new operators. 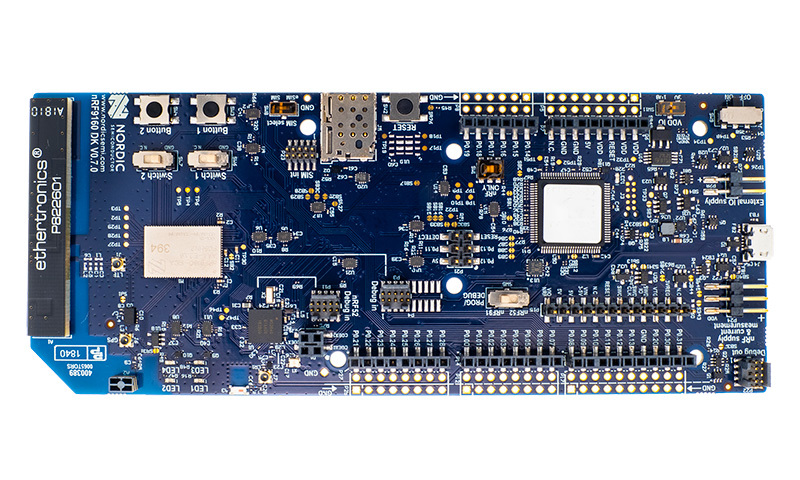 The nRF9160 Development Kit is a pre-certified single-board development kit for development and test on the nRF9160 SiP. The dedicated LTE-M and NB-IoT antenna supports a wide range of global bands, with a dedicated GPS antenna also available. The nRF Connect SDK includes everything you need to get started with end-to-end sensor sensor to cloud development. Some existing cellular products are challenging to design with, and in some cases offer limited functionality. Nordic’s nRF91 Series hides the complexity enabling developers with little or no cellular experience to focus on the LPWAN-based application. While this is Nordic Semiconductor’s first Cellular IoT product, the development team has thousands of man-years of experience in the field. For the past three years, experts with a background from the likes of Nokia, Broadcom and Ericsson have been working in Finland to bring the nRF91 Series of products to market. You can read more about our approach to low power cellular IoT here, and interact with our global community of technical experts and developers on the Nordic Dev Zone. Nordic products are made available and affordable for everyone, with almost all software and development tools being totally free of charge. We are excited to see what you come up with!